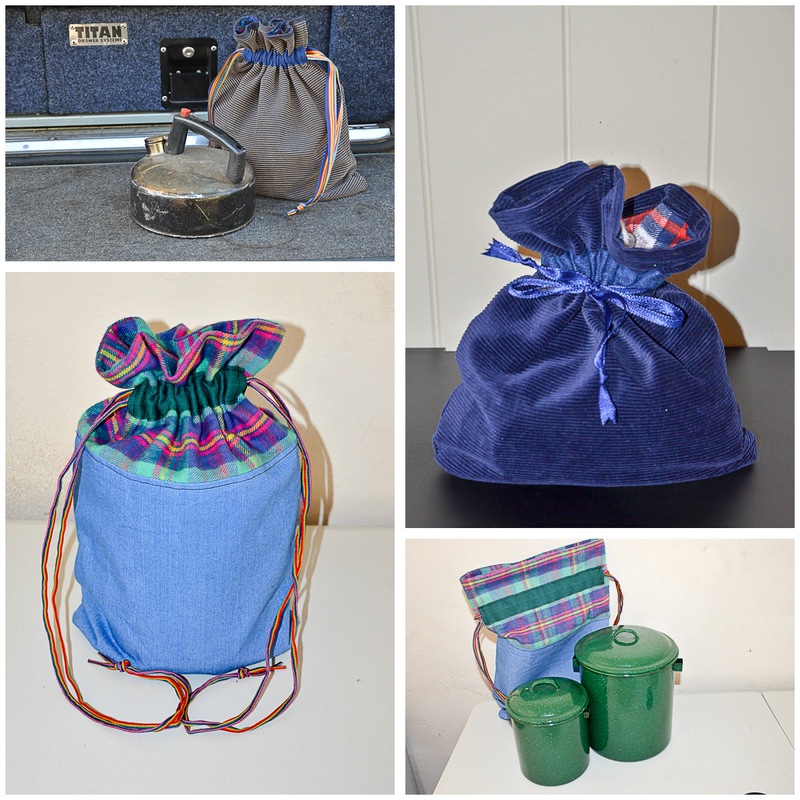 Happy Hamby Campers: Bags the loo! Last September I made a bag for our picnic kettle. I really liked how it turned out and have used the same method to make various other bags since - one for a pair of billies, one for shoe-cleaning equipment and now several dubbed "new car kits". What's a new car kit? When I wanted to give gifts to all the new car owners in our family, I chose to make something practical. I've kept a hand-towel, small soap and loo paper in Elmer for quite a few years. When we were still in Victoria, I trialed a different storage method for those items. It worked for a while but I'm sure my new system is better. 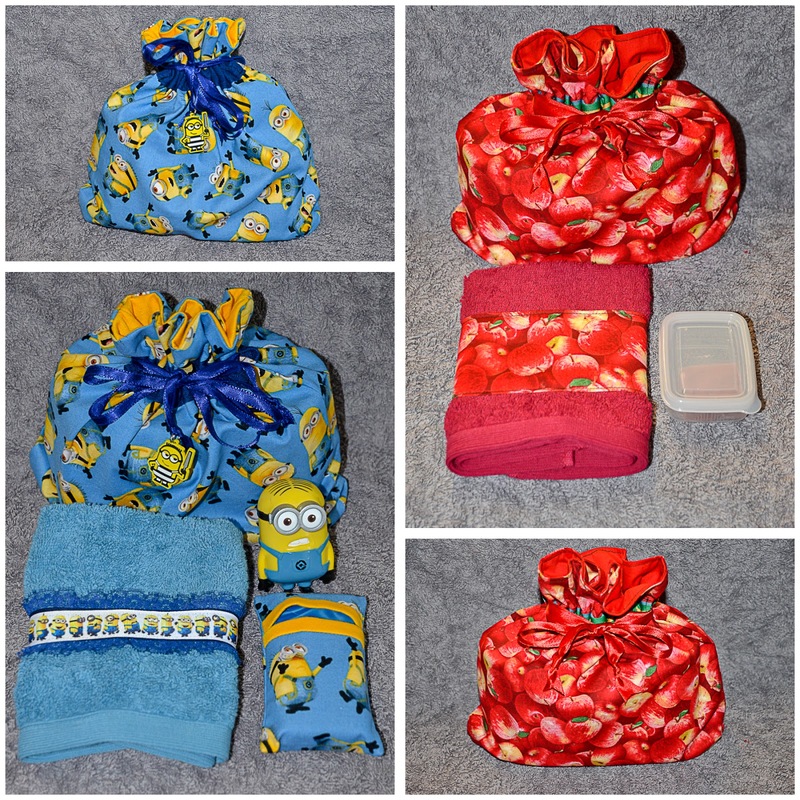 The minion and apple drawstring bags each hold a roll of toilet paper, small hand towel (well, technically it's a large face washer) and soap. Erin's minion set has a small pack of tissues but she may choose to stash them elsewhere. I'll probably include a little bottle of hand sanitiser in the bags as well. We've visited a lot of public toilets over the years. 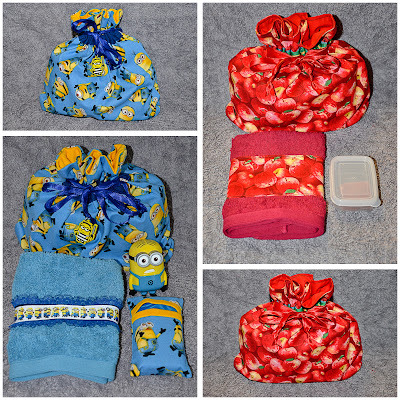 They vary greatly in terms of quality, so we carry our own supplies. Generally soap and hand towel are enough but sometimes we do need to take loo paper. (If we are particularly well stocked, we are happy to leave a roll in the cubicle - cos we're a generous bunch)! From time to time there isn't water available at the public conveniences, so we wash hands back at the car - cos we carry water with us, even on day-trips. If all else fails, we use hand sanitiser!